I’ve written before about my desire to help Harley develop. It’s not just about making her a genius, which would obviously be great, but also about making her a well-rounded person with all the motor, cognitive, emotional and social skills she’ll need to thrive as she grows up. But it’s really weird with a baby. I mean, on the one hand, they are sort of like blobs who can’t really do that much, but on the other hand, their brains are developing faster than they ever will. They are learning so much all the time, even if it doesn’t feel like it, and there are all sort of things that we can do to help them. I’m enjoying Harley a lot more now. She is so much more engaging – she smiles when we do things, she loves to see me and interact with me, and she is so much easier to read now. Plus, the activities that we can do together are much more fun now, too. 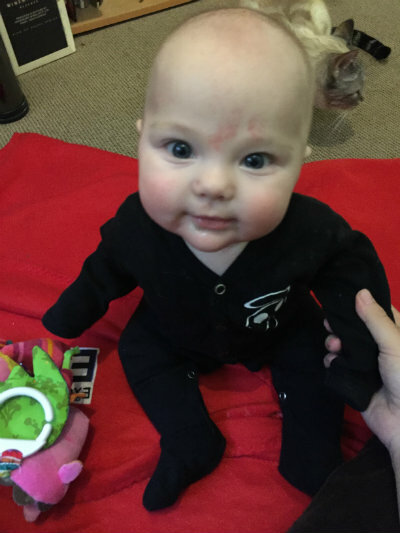 Sure, the 3-6 month activities were pretty cool, and the stuff we did when she was 0-3 months helped so much with bonding, but now it feels like we do things together instead of me doing all the work. 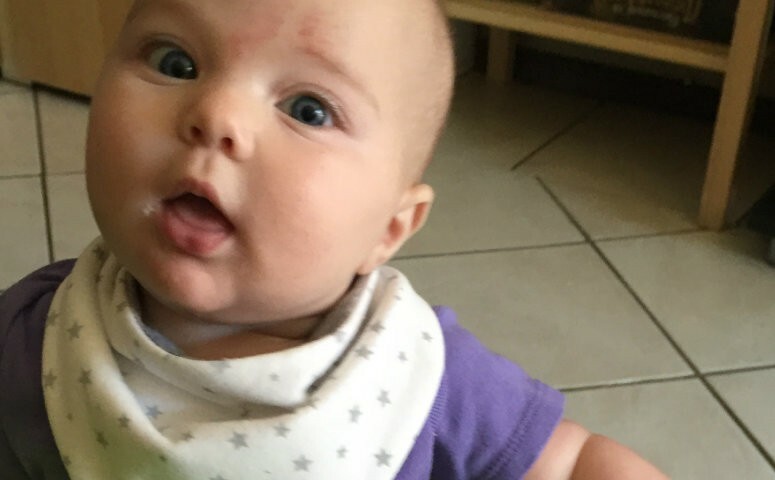 I’ve written before about the importance of Tummy Time and how I keep it interesting, but it really can’t be stressed enough. At this point, I’m aiming for about 20-30 minutes of tummy time per day. 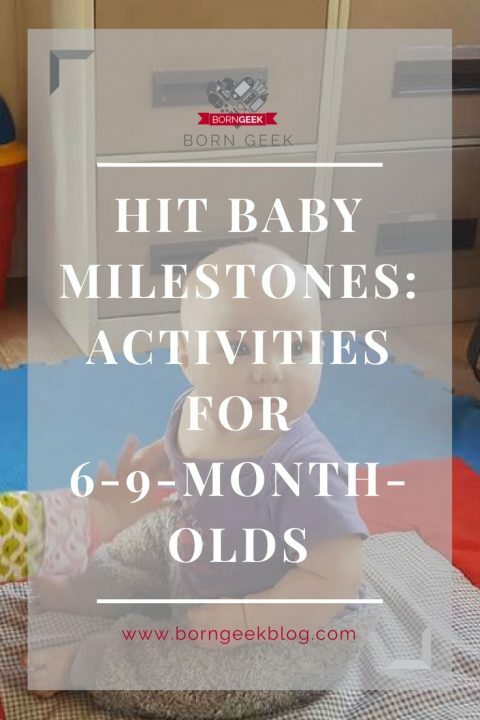 That doesn’t mean that Harley always likes it, but it’s integral to helping her build her upper body strength which will help with sitting, crawling, standing and walking. Lately, I’ve started to combine her tummy time with other activities. So, I will use a rattle to get her attention, boosting her auditory abilities – by shaking the rattle on different sides of her head or above and below her, it helps her to learn where sounds are coming from, plus it keeps her entertained while she’s on her tummy. A big favorite, though, is singing The Itsy Bitsy Spider. She LOVES when I sing to her, and that song helps her figure out up and down, and works on her visual tracking skills as she follows my fingers. Plus, depending on how high I go, she is even encouraged to do little tummy time push ups to keep her eyes locked on my fingers. At this point, Harley isn’t too great with reaching for toys. She seems to know when things are out of reach, and she doesn’t make the effort if she knows she can’t grab her toy easily. In order to promote grabbing and grasping, I will hold a toy in the same place, just within her reach, for quite a while. It’s important to give babies time to interact with things – often after a minute or two (which can feel like eternity), she will finally reach out and grab the toy. Another thing I’ll do is let her grab onto her toy and then slowly pull, sort of like a tug-0-war. It helps her realize that she can hold onto her things, but also how far her reach really does extend. Now that she can pretty much sit, we try to do a lot with Harley in the seated position. I will hold her hands to keep her feeling steady if she needs it, but she spends a lot of time sitting on our laps, sitting next to us on the couch or sitting on tables when we have drinks or chat. Again, I will sing songs like The Itsy Bitsy Spider or Twinkle Twinkle Little Star to boost her visual tracking and encourage her to stay seated instead of lying down. While sitting, I also try to expose Harley to a variety of textures and objects. Things that make noise, like crinkling paper or bells and rattles are definitely popular. But it’s also interesting for her to feel rough vs smooth textures, so I give her random household objects to play with so that she can feel them and see how they interact with each other. It’s amazing to see her discover which things make a noise, and what she likes touching and what she doesn’t. Finally, I still try to do some of the basic baby gym things. 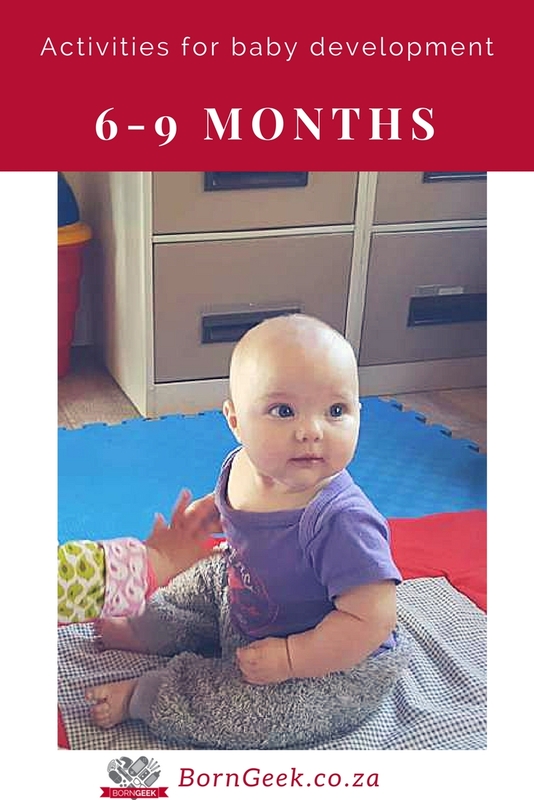 Bending and stretching her legs, crossing her midline by touching her opposite hands and feet, and even doing baby sit-ups are all helpful for promoting physical movement and helping to wire her brain as she begins to sit, crawl and move around. Of course I want Harley to be brilliant (spoiler: she already is), and a big part of that is helping to stimulate various aspects of her thinking. An easy and fun way to do this is to smile at her, a lot. I smile at her and watch her face light up as she smiles back. Then we play peekaboo, with me covering my face before smiling at her again, or covering her face before revealing myself again. It’s great for bonding and social skills, but it’s also excellent for object permanence – the understanding that just because you can’t see something doesn’t mean it’s gone. I also read to Harley. I try to read to her every evening. The books aren’t long, but I tend to read them pretty slowly, pointing out all the things in the illustrations. If she enjoys a particular story (not that I’m sure she knows what’s going on, but maybe she likes the sound of that book on that day), I might reread it to her. Repetition is so important for little ones – they come to be able to predict what’s coming, learning to anticipate and remember. Plus, the cuddles and closeness while Harley sits on my lap when I read to her are great for her social comfort – she is always happiest when I’m close to her. Babbling is also very important now. Harley is learning speech patterns, which means the more I talk to her, the better. I try to spend time in the morning talking about my plan for the day. If she’s awake when we drive Dean to work, I tell her what I need to do when we get home, giving her the itinerary for the day. Then, throughout the day, I try to describe what’s happening and what we’re going to do together. Even just changing her nappy, I try not to do in silence even though I might actually be lost in my own thoughts. Most importantly, though, I always try to respond to her babbling noises. She is trying to figure out how to talk, so I leave space for her to talk and respond as if I actually understood what she said. Plus, I do it in ways that make me laugh, which is also important now. So I might pretend that we’re both making fun of someone, or discussing politics, or that she is explaining the Brexit situation to me. Whatever the discussion, I try to use a natural ebb and flow as if she really were conversing with me. The main thing is that I try to spend some uninterrupted time with her every day. It’s so easy for me to get caught up in work or being with Dean or with friends, it’s important to take a timeout and just give her my undivided attention. She loves when I stop working and just spend a few minutes “chatting” with her or singing or playing on the floor together. It doesn’t take long, but it makes a huge difference. And the more time we spend interacting now, the better my chances of having a child and eventually a teen and adult who wants to interact with me as she grows up. For baby development for 0-3 month-old babies, click here.